Today's ride to work was relatively uneventful, but at the same time I was reminded of the little diversions that make riding a bicycle more interesting than driving a car. I suppose that it helped that I wore my Charlie Brown t-shirt today. That tends to make people smile, even if it only to say "look at the nut job on the bike." As I cut through the park, I slowed a bit as I came near some geese. As I came closer, I noticed that one of them was leading 4 or 5 little yellow and gray goslings. It was terribly cute. I fumbled for my phone to snap a quick picture, but they were already on their way into the stream. Now, when I think back to times when I've seen geese while driving it was rarely a pleasant experience. In fact there was probably some car horn honking involved. 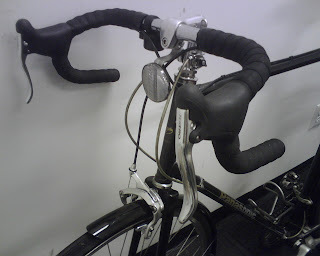 Then, as I neared the park exit I overtook an older man pushing a beaten up old mixte-framed 10-speed up a small hill. I slowed and noticed the improvised front cargo rack, supported by a single oxidized metal strand of linguine on either side. I offered my wrenching services. His reply was "no unnestan English". I wished him a good day and continued on my ride. As I rode away, I guessed that he most likely just pushes the old mixte up the hills for lack of shifting ability. Regardless of the reason or level of language comprehension, though, it's nice to interact with other people in a way that's impossible while confined behind energy absorbing steel crumple zones. OK, so it's been a while- almost a month since I last posted. My email has a few posts that I started but never finished. I guess that's how it goes. Life continues to blaze by and something has to yield. Usually it's the blog. I'll fill in a few things that are new, just in case anyone actually reads this. received a long awaited upgrade. The long reach, dual pivot calipers fit nicely over the fenders after a little creativity and some good advice from the website of the late Sheldon Brown. Stopping power has increased noticeably- important for someone of my considerable mass, and the new brake levers add more hand positions. It was a very worthwhile upgrade. A couple of days after the upgrade, I had my first collision since I started commuting by bike. Luckily, though, it was with a little kid in the park, also on a bike and not with a motor vehicle. Here's how it happened: I took a shortcut through the park as I always do. It's a little slower than the street, but it's shorter and makes for a nice breather. On a narrow stretch of path I met a mother with two young boys, traveling largest to smallest. The mother (largest) gave no sign of altering her path even slightly, so I steered into the mud about a foot off the paved path. Her sons followed her lead, and gave no room. The last in line (smallest) actually swerved toward me, caught my hand with his handlebar and took out my back wheel. Very little damage was done to my bike. The back wheel should be OK with a little truing. My hand was a little cut and bruised, but didn't cause too much anguish. Looking back, though, maybe I behaved a little harshly. I was pretty shaken from having been knocked from my bike and I was a bit on the defensive, expecting his mother to lay onto me for knocking down her little boy. I just hope I didn't turn off anyone to bicycling in general. But back to my intended topic. I think I'm addicted to biking. I find that when I start my day with a bike ride I'm more alert, I focus better and have more energy all day long. In contrast, when I drive my car to work and have no physical activity, I feel groggy, irritable and sometimes even a little jittery and anxious. I have to wonder if this is how I felt on any given day before I started getting exercise. I think I'll keep it up.